Formed in April 2009 by Musical Director Jonathan Bligh, The Festival Statesmen Youth Chorus is a dynamic all-male a cappella vocal group. The chorus exists to provide a platform for young Adelaide singers to achieve vocal and performance excellence. Membership ranges from middle school through to young adults. Among the ranks of singers are several quartets. The chorus is fortunate enough to be a part of two major singing organisations; Barbershop Harmony Australia (BHA), and the Australian National Choral Association (ANCA). Through these organisations the chorus has access to national and international educators, vocal coaches and performers. As a result, FSYC offers SACE units for Year 12 Ensemble Performance Students and annual vocal workshops for secondary school students. The chorus has a strong competitive spirit. 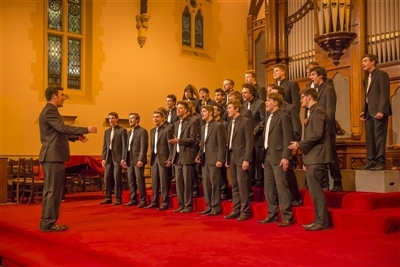 In 2012 the chorus entered the Adelaide Choral Eisteddfod and won all the categories they entered including; Open Male Voice Choir, Open Chamber Choir and Open Small Choir. They were also awarded the Choral Excellence award for 2012. In September of 2011 the Chorus travelled to Queensland to compete in the National and Pan Pacific Region Barbershop Competitions and was awarded bronze medal in the Open category and a gold medal in the Youth category. During October this year the Chorus competeted in the National Harmony Competition in Perth a won First Place in the Youth Chorus Competition and Second Place in the Open Category. Jonathan is a Vocal Coach, Musical Director and Secondary School Teacher of Music. Jonathan has a Bachelor of Music in Solo Performance (flute) and Conducting (Elder School of Music), a Graduate Diploma in Education (University of Adelaide) and a Licentiate of the Royal Schools of Music in Performance (London). He has been Musical Director for Shane Davidson Presents Les Miserable (2012), Gin and Vodka’s productions of the musical Spring Awakening (2010) and Gypsy (2011). He has also studied with Rodney Eichenberger in America as well as representing Australia in an international choral competition. He recently returned from a very succesful tour to Europe where he performed with the Adelaide Chamber Singers under the Direction of Carl Crossin OAM and won Choir of the World at the 2013 Llangollen International Musical Eisteddfod and other awards. For just over 20 years, The Grammarphones has been the premier small vocal ensemble at Toowooomba Grammar School specialising in Doo Wop, Barbershop Chorus and Rockapella styles of modernA Capella singing. Usually numberingbetween 14 – 18 voices this ensemble enjoys a high profile in the Toowoomba community, winning regularly at the eisteddfod and other competitions, participating in community and School events and regularly performing around South East Queensland including participation inthe first Pemulwuy Festival in 2008. Last year, they were runner-ups in the prestigious National Aus-Aca Awards, Secondary School Section. They have also toured overseas to the U.S.A. twice and Central Europe. Last year the boys made lots of new friends and followers at the Hobart Festival Voices performing regularly and working closely with Deke Sharon (USA) of ‘Pitch Perfect’ and ‘The Sing Off’ fame. 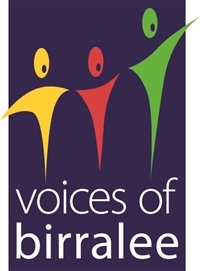 The boys are looking forward to taking part in such a wonderful event celebrating the male voice. Anthony Young is Head of Classroom and Choral activities at St. Laurence’s College in South Brisbane. 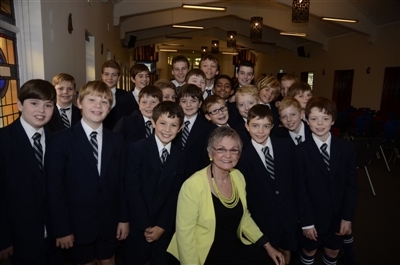 St. Laurence’s boasts a choral program involving over 150 boys in 4 choirs with a further 450 students involved in classroom and instrumental music. He holds a Masters in Music Studies (choral conducting) together with an Australian Kodaly Certificate, an Arts degree in Literature and a Law Degree. He is an experienced choral conductor having studied with Dr. Eduard Bolcovak, Dr. John Nixon, and Dr. Rodney Eichenberger. At St. Laurence’s he has enjoyed success in dealing with the male changing voice. He has studied the work of David Jorlett, James Jordan, Kenneth Phillips, Jerry Blackstone and Leon Thurmann amongst others. He is an experienced Music Educator having taught secondary music for twenty years in both state funded and private schools. He is presently undertaking Doctoral research in Music Education. 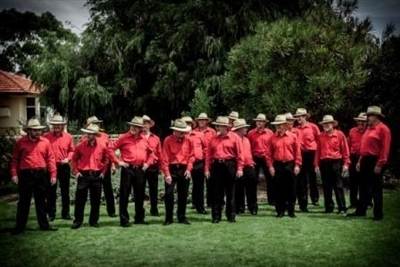 Bunbury Men of Song (BMOS) was formed in 1998 and has a membership of 35 aged from 18 to 80. Men travel from all across the greater Bunbury Region to participate in rehearsals and performances. The choir’s repertoire includes songs from shows and musicals, the classics, gospel, Australian, even rock and roll all with the unique BMOS style of ‘fair dinkum South West. Bunbury Men of Song is fortunate to have Ian Mills as their Musical Director and Greg Ross as Accompanist. 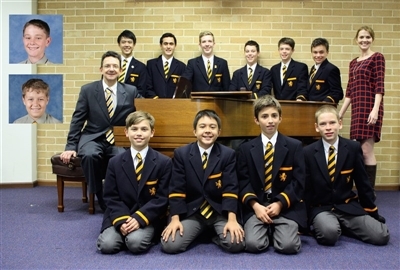 A training group of the Australian Boys Choral Institute, named after the founder of the Australian Boys Choir, Vincent J Kelly. The Kelly Gang is a group of boys whose voices have begun to change and who have chosen to continue their vocal and choral interests — learning to cope with their "new instrument". Most members of the Gang are former senior members of the Australian Boys Choir who have been invited to join, but singers who can demonstrate equivalent skills are welcome. There is a strong emphasis on vocal technique. Some singers use the group to complement the work they are doing in private voice lessons, while some boys may wish to develop their musical leadership qualities by learning some techniques of conducting. Artistic Director Noel Ancell is a well-known voice teacher as well as one of Australia's leading choral conductors. The Gang is occasionally involved in performance with The Vocal Consort and the Australian Boys Choir, but performance is not a major activity during this transition stage. Individual development is promoted in an enjoyable, stress-free environment, with emphasis on control and development of the changing voice and consolidation of reading and other musical skills, together with the opportunity to maintain social contact with others of similar interests and skills. In addition to the 2 hours of rehearsal each Sunday afternoon (4.30 - 6.30), members of the Kelly Gang attend 5 days of intensive workshop at the annual Summer School of the ABCI. In 2013, as for the past five years, leading Brisbane music educator Anthony Young worked with the Kelly Gang. The Scots College has brought twelve singers from the two choirs in the High School. 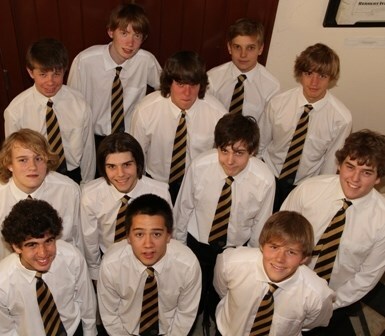 Scotsmen Aloud is a choir of twenty two boys from years 9 to 12, and the Middle Years Choirs consists of sixteen boys with unchanged voices in years 7 and 8. The two choirs enjoy singing both together and separately at school concerts, chapel services, and occasional invites from the wider Sydney community. Last year the boys sang at the birthday of the Prime Minister Tony Abbott, and also the national anthem at the start of a Sydney Kings Basketball game. 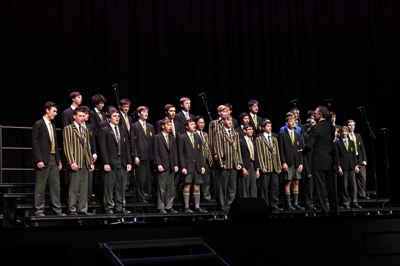 Scotsmen Aloud were very successful at the 2013 Sydney Eisteddfod winning the Youth Male Choir Class, and coming second out of eight choirs in the Youth Sacred Choral Class. 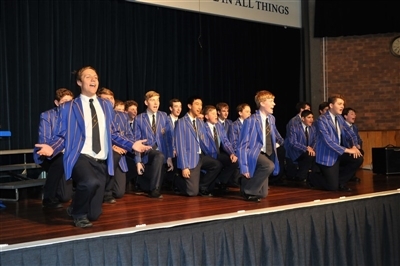 The boys are thrilled to be invited to sing at Pemulwuy 2014, and join other boys who love singing. James is both a Graduate and a Fellow of Trinity College of Music, London where he won many of the College’s major piano competitions, and performed at London’s Wigmore Hall. Before moving to Australia, and in addition to being the Director of Music at Wellington College, James enjoyed a varied career as a professional pianist and organist in New Zealand. As a Choral Conductor his choirs have toured extensively overseas, presented at conferences, and appeared on Australian national television in Channel 7’s “Battle of the Choirs”. James was Director of Music at Barker College in Sydney for 16 years where he oversaw the establishing of one of the largest school music programmes in Australia. The “Blokes of Barker” attended the first two Pemulwuy conferences, and he is delighted to be able to bring singers from his current school The Scots College, to this year’s conference. In August he takes up a new appointment as Director of Music at MLC School in Sydney, an all girls school renowned for its musical excellence. The NJC Kinsmen are an energetic team of high achieving young men who love to sing. For many years, under the wonderful direction of Barb McGeever, they have admirably represented Nudgee Junior College at various school, civic and community events and have consistently brought home ‘gold’ at competitive events. Their vocal tone which reminds the listener of what a pleasure it is to hear well trained boy sopranos, is always enhanced by a contagious enthusiasm and charm. They adapt to wide range of repertoire selections and can deliver the perfect atmosphere at everything from a formal ceremonial event to a debonair music theatre number. Ms McGeever is proud of their level of commitment and dedication to singing amidst a frenetic pace of extra curricular endeavours. In her own words ' NJC Kinsmen – energy plus - you rock! The Chamber Choir is one of five choral groups at Brisbane Grammar School. It is an auditioned group of thirty treble singers who are all undertaking vocal tuition. They sing in three parts and regularly perform at School Concerts, Church Services and Nursing Homes. In 2009 the Chamber Choir toured to Tasmania, performing at the ASME National Conference as well as the Hobart Festival of Voices. In 2010 they were invited to perform at the KMEIA National Conference in Melbourne, taking with them the exciting new Paul Jarman piece “Parkour”, which they commissioned. They are very excited to be involved in the Pemulwuy Festival and are greatly looking forward to hearing outstanding male choirs from around Australia.